Learn how to choose your business's search categories and improve SEO. 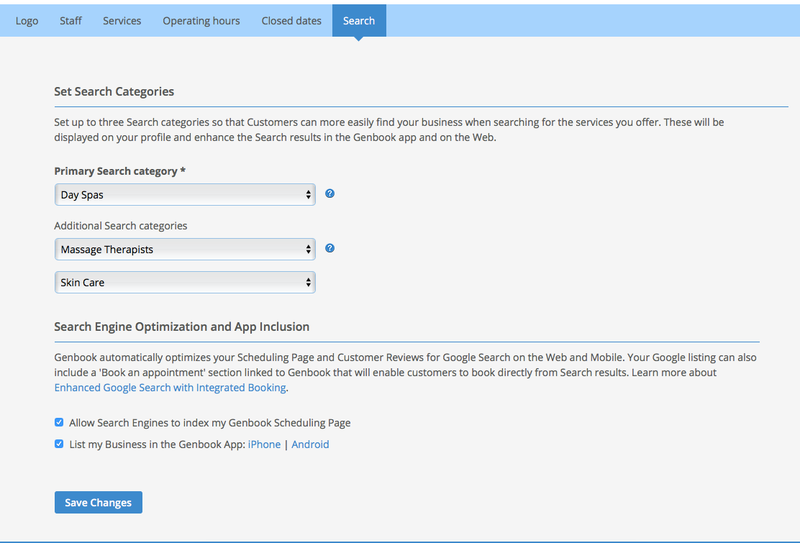 On the same screen, you can choose to allow search engines to index your Genbook Scheduling Page, which means allowing your scheduling page to be displayed in Google, Bing and other search engine results. We optimize your scheduling page for high ranking, and highly recommend enabling the ability to have the page indexed. We also recommend listing your business in the Genbook app, where customers can find and book you easily, plus have a more robust and streamlined experience with your business. This also lets potential customers in your area find and book your business right from the same app they may already be using to book other types of businesses nearby.